Change giving isn’t that simple. It would mean that they would have ensure that each meter was properly stocked with the coins needed to give change. Every day. Imagine how upset get if they expect change and then don’t receive it. Buses also typically don’t provide change for this reason. Dublin Bus have operated an ‘Exact Fare – No Change’ policy for years now. In the case of over-payment, they issue a ticket receipt which can be exchanged at Dublin Bus HQ. Oh, and they don’t accept notes either! The worst example I saw of this was the machines to buy bus tickets. In central london, you have to buy a ticket before getting on board. This wasn’t such a problem when tickets were Â£1. But when the price went up to Â£1.20, bus stops were flodded with furious people shouting at drivers. @Stephen: I understand that the machines would have to be stocked properly. But they’re emptied at least once a day anyway, so it’s not as if it would be significant extra work. If the prices were set at a level where the likely required change could be predicted (e.g. 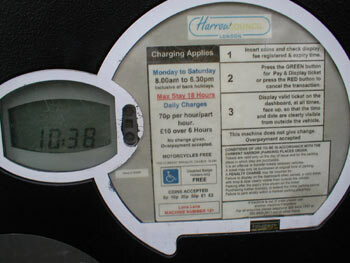 in the example above, if the price were 80p, and the machine took 10p, 20p, 50p, Â£1 and Â£2 coins, then only a stock of Â£1 and 20p coins would be needed as change, no matter what coins were put in). There’s also the possibility of a ‘change low’ light, as often used on rail ticket machines towards the end of the day when the change stock may have depleted. In my experience people don’t despise this as much as knowing they’ll never get any change at all. @undulattice: Interesting – that seems very fair, actually giving customers a redeemable receipt for overpayment. I would guess that a large percentage of people never get round to redeeming them, especially if the excess amount is low, but it’s the principle of treating your customers well which is impressive. @Tom: That’s a great example. And you know what will happen – the fare will be subsequently increased to Â£2 for ‘convenience reasons’, whilst also ‘encouraging’ more people to switch to Oyster cards and give up their privacy and anonymity (I think we’ll have to leave the Oyster card debate for another day). I can’t remember which one, but there was a charity in Dublin that started collecting the Bus refund receipts and cashing them as donations. Great idea. London bus tickets. These are now Â£1.50. I saw a couple trying to buy tickets at the machine – all they had was Â£1 coins,so they had to pay Â£4 for two tickets. If they could have paid the driver, they could have got two tickets for Â£3. Or, of course, if the machine was designed in a way that allowed multiple tickets to be bought with a single payment. Here in New York, like most major cities in the US, parking meters are priced way below their market value – so “the house always wins” claim wouldn’t apply here. 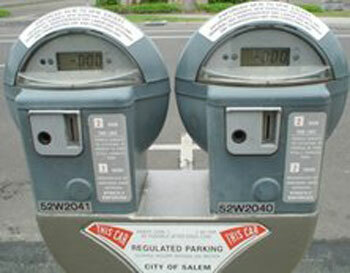 Anyone able to find a metered spot is getting a real bargain, even if they don’t have the right change. I have been pondering this question for sometime, firstly how much extra revenue is gained through not giving change, and what they should do with the money, seeing as it is not through choice and i would assume nobody wants to tip…..surely the overpayments should be declared and given to charity, that would make me much happier to overpay. Failing that they should charge by the minute and you get the exact time that you pay for. I think we all know why the parking companies do not give change or offer any other solutions. And what do they do with the money, I dont believe they are legally entitlef to the unfair undue proftovercharge. I overpaid at a hospital car park. My wife’s appointment went slightly over the printed time on the ticket. We were slapped on with a ticket. Upon rough calculations i estimated that with the amount I overpaid I would be entitled to stay 11mins over the stated end time. I wrote to appeal against the PCN and was refused! Where is the justice. AND THEY SAY THAT THERE IS MORE CORRUPTION IN THE SO CALLED “DEVELOPING COUNTRIES” OR 3RD WORLD COUNTRIES.